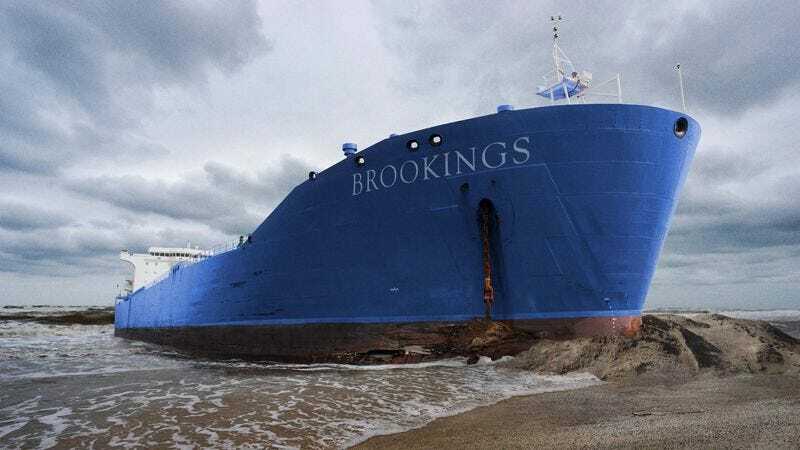 YALTA, CRIMEA—In what is being called the worst environmental disaster in the region’s history, millions of policy proposals gushed into the Black Sea on Thursday after a Brookings Institution think tanker ran aground off the coast of Crimea. “Cleanup crews are working around the clock to contain this massive flood of position papers on economics and global development,” said Brookings Institution president Strobe Talbott, adding that booms had been brought to the site to halt the spread of the nonpartisan research while skimmers had been deployed to collect the policy briefs from the ocean’s surface in hopes of preventing currents from dispersing them over a far greater area. “We’re doing our very best to limit the exposure of marine habitats to the analyses of sub-Saharan energy infrastructure, universal basic income, and automation in the labor market, but it could be months before we know the full extent of the damage.” Talbott went on to say that the Brookings Institution had already pledged $200 million toward cleanup efforts thanks to generous donations from the William and Flora Hewlett Foundation, the Hutchins Family Foundation, and the John D. and Catherine T. MacArthur Foundation.